Congratulations to Betty Overington Knupp ’67, who was selected as the 2017 recipient of the Award for Excellence in Public Service! Betty was honored at the AAGC Annual Meeting on April 29, 2017 during Alumnae/i Weekend. 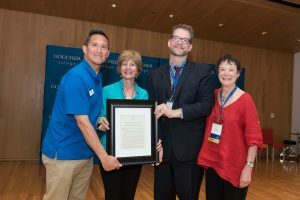 Her profile in the April 2017 edition of the Goucher Newsletter can be read here. 2. Breadth of service or intense focus on one organization. 3. Mentoring others to lead or carry on service; role model. 4. Number of people benefiting from services. 5. Philosophy about service; directed choices, goal-driven; deep personal commitment. 7. Unique type of service; pioneering leadership. 8. IMPACT of service on affecting CHANGE or INNOVATION. 9. Nominees remain actively considered for a period of five years. 10. Special consideration should be given to alumni who are celebrating a reunion so that there is more of a presence of their classmates and friends at the award presentation/celebration.